Our annual Adam Smith Lecture showcases pre-eminent modern thinkers who continue to advance the ideas of Adam Smith. 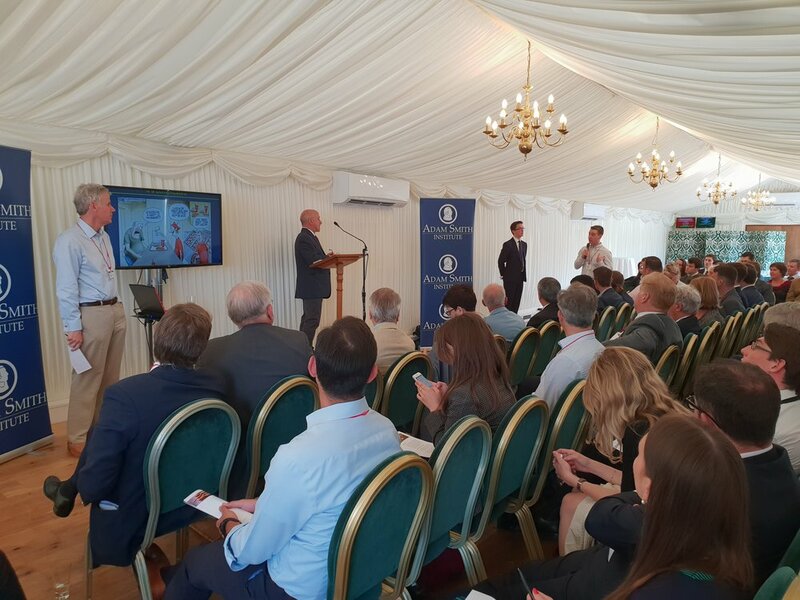 This year's speaker, Professor David Neumark, delivered a lecture on Monday 11th June at the Houses of Parliament on the topic of “How policymakers should think about the minimum wage”. He is the world's leading economic expert on the effect of minimum wages on unemployment, having published over fifty papers on the subject. He is Professor of Economics at the University of California, Irvine, Research Associate at the National Bureau of Economic Research, a Senior Fellow at the Public Policy Institute of California, and a Research Fellow at the Institute for the Study of Labor. A full copy of his lecture slides can be obtained here and a full transcript of the speech is below. After the speech Professor David Neumark joined us in the ASI offices where he gave a brief overview of the speech. "Economists have been studying the minimum wage for over 100 years. There are studies from the 1900s in the US - and that’s just the US evidence. I’m going to be focussing on the US evidence for two reasons. One is it’s always better to talk about what you know than what you don’t know, and secondly and more importantly, the US gets a lot of attention in economic research because we have fifty states that do their own thing, which gives us an amazing laboratory for studying the effects of policy which in most other countries are national. So I’ll talk a little about the UK minimum wage much later but one of the challenges you face in the UK, and in France, and in Germany and in many other places in trying to figure out what the minimum wage does (or did) is that it’s a national minimum wage and it’s hard to know what to compare it to to know what would have happened otherwise. So that’s the reason for my focus on the US. Take it as an environment that gives us a lot of good evidence and in many ways - I think most economists agree - the UK and US economies are closer in function than almost any other rich economy. "So, let me tell you a little about what’s been happening in the United States. We have a federal minimum which hasn’t gone up since 2009. It’s seven dollars and twenty-five cents, which is lower in dollars than your top minimum wages in pounds, of course, but reflecting the fact that in the US states can do whatever they want - and to some extent in some states, cities can do whatever they want - we now have many many higher minimum wages across the country. There are twenty-nine states - that could be up to date but it changes every day - have a minimum wage above the federal level. The highest currently at the state-level is $11.50 in DC, which people who are experts will know is not really a state but we talk about it that way. City minimum wages have gone even higher; Seattle is fifteen, a little town near Seattle is over fifteen, San Francisco is going to fifteen (indeed, the whole of California is going to fifteen by 2022 I believe as is much of New York State). "Now, although the federal government has laid low for nine years, there’s a strong movement to very high minimum wages. So one question you might ask, is “why?”. What this chart shows is one element of what’s driving this. It shows you male full-time earners and the ratio between median earnings and the tenth-percentile. And what you can see is that it’s gone up a lot. Inequality has gone up a lot - that’s a fact - in the US, the UK, and many other places. Now, if all incomes were rising but people higher up were rising faster, we might not be as concerned, but the fact that the people near the medium and higher have had real earnings growth and the people near the bottom have had stagnation or even decline depending on how you deflate wages. So that’s one thing that’s driving the high minimum wage movement, the other is what’s happened to poverty. In the graph, the yellow line is the poverty rate and the orange line is the economic growth. The US, like all western countries, has had a long-run trend of economic growth and income per capita rising. The poverty rate in the US has remained remarkably stable over the past decades and that’s particularly discouraging when you think that our poverty measure is an absolute measure not a relative one. We have an absolute poverty standard roughly based on three times the typical food basket for a low income family. Should we have an absolute poverty line and an economy getting richer, you would kind of think poverty should fall. The fact that it hasn’t is a reflection of growing inequality. So that’s the second fact that drives [the efforts for higher minimum wages]. "So what’s happened is low wage workers have fallen behind, and that’s not news to anyone who follows the economy. The minimum wage is clearly a response to that. First of all, it’s worth thinking about why low wage workers have fallen behind because of course understanding the reasons tells us something about what responses might be. There are five factors people talk about in the US. One is a weaker union sector - private sector unions are essentially out. The private sector union membership in the US is now below seven percent - largely non-existent. The public sector is heavily unionised, but unions have gone from the highs of thirty-five percent of the workforce to below seven percent. And unions do equalise earnings to some extent. International trade has also worked against lower wage workers. High skilled workers in the rich countries clearly benefited from globalisation, whilst low wage workers compete with lower skilled people from other countries and their wages have fallen. If you design iPhones you’re paid more money than skilled people have ever made, but people who build iPhones are now competing with people in low wage countries. People talk about immigration, in particular our president although he’s by no means the only one, but it’s actually rather hard to find strong evidence that immigration has pushed down workers’ wages, which may seem like a surprising statement but there’s a lot of research on this. I would say at most you really really isolate the least skilled: the high school dropout, minority group, people who really might compete with immigrants and there you might find evidence of wage decline. It’s hard to pin larger-scale wage declines on immigration, and I think the reason is simply that people forget that immigrants bring labour supply, and that’s why they could push down wages, but they also bring themselves and they demand goods. So immigrants increase both demand and supply which is why the idea that they push down wages could be misleading. Technological change and if it ties to low skilled workers in terms of whose work gets automated. That paper that just came out with Grace Lordan at the LSE about minimum wages and automation showed that when the minimum wage goes up, the low skilled people in the highly-automatable tasks (the one most prone to be replaced by technology) are really the ones who take it on the chin. And finally, the minimum wage has declined in real terms. This is the real value of the federal minimum wage going back to the mid-1970s. You get a huge decline in the early part of the period - inflation was higher and the nominal minimum wage hasn’t changed - and then it kind of settled down over the latter part of the sample, but it is lower than it used to be. The federal minimum wage buys less than it used to buy. "So all these facts really provide the three reasons people talk about when they try to argue for why we should raise the minimum wage. One, it hasn’t kept up with inflation; two, coupled with other changes there’s been a rise in inequality; and three, the growing economy has not reduced poverty, itself a reflection of inequality. I would say that if you look at the “Fight for Fifteen” movement - this is the movement that is really pushing for fifteen dollars on the national minimum wage, endorsed by Bernie Sanders during the last election, and likely to be endorsed by most Democrats running next time around. They actually make more arguments than that. They agree that the minimum wage has declined, and insist that it should not have declined. The minimum wage should preserve its purse and power. We’ll talk about those two things briefly. The third and fourth and fifth are that the minimum wage will counter the rise of inequality, it will help low wage workers, and it will reduce poverty. I’m going to discuss each of these in turn, the latter two will take up the bulk of my talk. "FDR once said - and the Fight for Fifteen movement is fond of quoting him - “no business that depends for existence on paying less than living wages to its workers has any right to continue in this country.” FDR was a great man, this sounds like strong statement, and this is the media depiction of what’s happening in the US, where the rich are getting richer and the middle wages lower. People do view it as immoral and I get this argument all the time, usually after I’ve discussed evidence and people have nothing left to counter with. What I usually say is that there are two different types of statements that can be made here; the normative and the positive. One statement is “the distribution of incomes should be more equal”. The second statement is “we should raise the minimum wage to reduce inequality and poverty.” Now, the first is just a value judgement. I can’t tell you if it’s right or wrong - everyone has their own view of what the distribution of resources should look like. I have a PhD in economics so I know how to do a lot of things with data pretty well, but I have no authority over anyone in this room - or anyone else for that matter - with regard to the first statement. I sometimes tell people, “ask your priest or your rabbi, don’t ask me.” The second statement here “we should raise the minimum wage to reduce inequality and poverty” is a bit of a hybrid but it rests on what’s called a positive conclusion, that is, as a fact, what would happen if you raise the minimum wage. If you raise the minimum wage, would it in fact reduce inequality and poverty? Presumably also, if you endorse the second statement, you should also believe that this is probably the best or a necessary policy in order to achieve these goals. And it’s the second type of statement I spend a lot of time and a lot of work on so I wanted to talk most about that. But I do want to point out that when you listen to debate, you can’t get from “a low minimum wage is unfair” to “you should minimum wage to reduce poverty and inequality” in any logical sense. One is a value judgement and we should think income should be more equal, and we can talk about all the different ways we might do that, the other is a specific statement about what a policy does, what its effect is, and whether it’s the most effective way. "So that’s what I’m going to say about the morality of the minimum wage. It doesn’t really drive the debate because it doesn’t answer the question about what is the right policy. What about a decline in the real minimum wage? The second contention of the Fight for Fifteen movement - and you hear this again and again and again - is that the real minimum wage has declined and therefore we should correct it. So this is a statement from the White House in better days under Obama: “since it was first established in 1938, the minimum wage was eroded substantially under several prolonged periods because of inflation. The proposal to raise the minimum would restore the real value of the minimum to what it was in 1981.” And as I said, the yellow line shows that the real value of the minimum wage has declined but there’s something people miss when they make that statement and that is that we have other policies now, in particular we have a very very aggressive policy in the US which is like your Working Tax Credit, we call the Earned Income Tax Credit. I’ll talk about that in more detail later, but it essentially provides an income floor for people who work. It varies with number of kids and your income but if you work, it provides an income floor. The minimum wage also provides an income floor, if you work. The orange line is the minimum income floor for a full-time worker calculated for a single parent with two children. What you see is that the two policies together have actually provided an income floor as generous, or more generous, than we used to. And that’s important because we have one policy, we invented this other policy - a brilliant policy in my view and I’ll tell you why I think that later. I think we decided it’s a better policy and we now spend far more on it in the US than we do on welfare, seventy-or-so billion dollars per year so either we’re foolish or we really like the policy. One interpretation of what’s going on is that we had this one policy, the minimum wage, (maybe it has some benefits but some things we don’t like), we invented this other policy (we’ve made it more and more generous) and we think that’s a better way to help low income families so why not let the first policy whither? It makes perfect sense. So, whatever you think of the two policies, what I mean to say here is the simple argument that we should raise the minimum because it’s lower in real terms than it used to be - which you hear in the US and you hear it in other countries - doesn’t make sense. You have to look at the totality of policies that help low income families to make any assessment of how stingy or generous this statistic is. "The third contention is that the minimum wage will reduce inequality. I’ve changed the scale of the same graph from before showing the ratio between the fiftieth percentile and the tenth percentile. So you can actually see, if you look closely, it actually goes up a little bit. I had to change the scale because if you want to put what’s happened at the top on the same picture, you need to do that. So this here is what’s happened but this is the ratio of the ninetieth to the tenth percentile. And it’s going on much more. The point of this is that a tremendous amount of the growth in inequality has really been driven by the very top end. If I did this for the ninety-ninth percentile, I’d have to change the scale again. For the top tenth of one percent, incomes have gone through the roof. Now, that may or may not be a good thing, depending on what you think but the point is that the minimum wage is not a solution to income inequality, which is driven by the top ten or one or one-tenth percent of the population. If all that had been happening was everyone’s income remained stable but the bottom was falling out you might say we should pin this on the minimum wage. The minimum wage is going to do nothing about the difference between these two lines and that’s a huge part of the story of rising inequality. "So those are the three contentions about how minimum wages that I wanted to deal with and I’m sure they come up in one form or another here but you’ve kind of solved the declining real minimum because you now have the Low Pay Commission. But now I want to turn to the two key empirical assertions upon which the research really focusses. One is, whether the minimum wage helps low wage workers and the second is whether it reduces poverty. When I was a graduate student, one of my advisors said, “before you start a new paper, ask your smartest uncle or aunt if they think the yestion you’re writing about is actually interesting.” I found this to be a pretty good test, but the other thing I found when I asked my smartest uncle or aunt what they thought was the answer to these questions, most people will say if they haven’t thought much, “yes and yes, obviously. How could the minimum wage not help?” Now of course we know the thinking is that the only thing that happens is that some people’s wages go up. End of story. If that’s all the minimum wage did then it would help low wage workers and it would obviously reduce poverty, at least to some extent. But the world’s not quite that simple. This is the simplistic view that if we raise the minimum wage to a million dollars then everyone will become Bill Gates, which obviously won’t work. What does economics actually tell us? Well, in general when we think about goods, we’re all very used to the idea that when we make things more expensive people use less of it, with a few exceptions. We tax gasoline to discourage use - at least everyone else does but us, we tax tax cigarettes to discourage young people from starting to smoke, we subsidise things we want people to do more of such as green technology and we see people use more of that. What about labour? Labour markets are a little more complicated because the demand for labour is derived demand. We buy a pizza because we want to eat it and a computer because we want to use it. Nobody hires workers simply because they want to hire workers. People hire workers because they use those workers to produce things that they can then sell and buy other junk with the money they make. So it’s a little more complicated to think about. What happens when you raise the minimum wage is you raise the price of low skilled labour by law. What happens in response? Well, first things firms think about doing is they economise on the use of low skilled labour. So they might substitute some from the lower skilled labour to somewhat higher skilled labour. They also substitute towards things that have nothing to do with labour, as I was reminded whilst standing in the line at Heathrow for two hours because half of the passport desks were closed because they probably pay their staff high wages. So sometimes they impose costs on the rest of us, but employers economise on these things. If you run a McDonalds you might have one fewer cashier and let the lines be a little longer. There are a lot of things you can do. When you do those things though, especially using higher skilled labour, or other things, in one way or another your costs are going to go up somewhat and then the price of what you sell goes up, and consumer demand for that falls. So if I produce fast food and I substitute away from low skilled workers because the minimum wage has been pushed up, my production costs are going to be higher which will raise my prices and if consumers are sensitive to that price, and many prices they are, that’s going to be another thing that reduces demand. So both a substitution away from low skilled labour and the price effect reducing the demand work in the same direction in lowering demand for low skilled workers. There are places where people aren’t sensitive to price, the line at Heathrow is a good example since I didn’t have a completing business I can go to to get through passport control that might run more efficiently. "So economic theory still says, when the minimum wage goes up we should expect employment to fall somewhat, at least out of effective workers. Is the theory right? This is where we wade into the hundred years of debate and then even more intense starting in the mid-nineties and starting all over again ten years ago. So I’m going to walk you through this. I can’t do justice to all research literature but I will try to give to give you a fair and balanced view of what the research says and then tell you what I think. So in the US we faced an issue similar to other countries. We had a national minimum wage and one of the only ways we could estimate the effect of the new wage was using what we call “time series data” which is data on the evolution of low skilled employment over time in relation to the minimum wage. That literature said that there’s an elasticity between -0.1 and -0.2, a number you may have heard if you follow the debate closely. What does it mean when people say that? The elasticity is the percent change in employment of the affected workers - often we’re talking about teenagers but it could be other low skilled groups - over the percent change in the minimum wage. So, if you raise the minimum wage by ten percent, an elasticity of -0.1 to -0.2 means that employment of that group falls by one to two percent. Some people say - maybe accurately, maybe not - that sounds like a pretty small effect. Remember, this is not overall employment. No serious economist thinks that raising the minimum wage sends the economy into recession. This is about the low skilled workers affected by the minimum wage. To give you some perspective, in the US depending on which state you’re in, five to ten percent of workers are affected by the minimum wages at the low levels we have them now. Obviously, were it at fifteen dollars, it would be a lot higher. The problem with that evidence is we don’t know what economists like to call the counterfactual. Studying national data, the minimum wage goes up in some year and I see what happens to employment, and I can attribute the change to the minimum wage but I don’t really know what to attribute it to. So for example, in the US we had the Great Recession in 2007-8 and the late market effects felt mid 2010 probably, we also happened to raise the minimum wage sharply in 2007, 2008, and 2009. When you have a recession these low skilled groups tend to suffer more than the skilled groups so unemployment of the low skilled went up a lot more than the higher skilled. If you’re just looking at the time series data you might conclude that the minimum wage made that happen and draw a faulty inference because we don’t have an observation that doesn’t exist in reality but we try to approximate what would’ve happened had we not raised the minimum wage. Now, because we have only state minimum wages in the US because I can look at two states or more states - one raises its minimum wage, one doesn’t - but I can choose states that looked pretty similar before then; they had similar trends, their economies looked the same. Now, the minimum wage goes up in one state and low skill employment falls in that state and not in the other state, I can more reliably say that it is an effect of the minimum wage. So that’s the great power we get from having all these states. To give you a bit of evidence about what we have in the US, this [graph] is the number of states with minimum wages above the federal level and it spiked in 2007 and we had a couple of federal wage increases so it went down and now it’s back up to thirty. So more than half of the states have a minimum higher than the federal, and they’re pretty high. This is the percent difference between the state and the federal so you can see right now the average percent difference is 25% and some states are way higher. So the federal is now $7.25, the highest state minimum wage is $12.50, and some city minimum wages are even higher. So you’ve got very large gaps now across these jurisdictions. "What does the evidence say? Well this is a hard one to summarise. Let me first talk about a large-scale review that Washer and I did. It’s now getting a little old, but we covered a lot of studies. This covered about 100 studies - I won’t give you the definition of how we defined which studies we covered - but pretty much everything we could read (in English) in the twenty years before we did this about 100 studies, and they’re all focussed one way or another on disemployment effects of the minimum wage for low skilled groups, they vary in a lot of other ways. Which low skilled groups, some are written about other countries, estimation methods and all that kind of stuff economists like to get excited about. About 100 studies and two thirds of them found negative effects, and our objective assessment of what were the most credible studies in terms of what we think makes a strong research design, convincing evidence, there were about 85% of them that pointed to negative effects. More importantly, I think which studies zoomed in most closely on the workers whose wages were pushed up by the minimum, that evidence was even stronger. That’s an important point that you want to remember. When the minimum wage goes up - remember what I said - one thing employers do is substitute away from the workers whose wages were just forced up towards other workers. Now they’re not replacing a high school drop-out at a fast food restaurant with a PhD, they’re replacing them with a high school graduate. It’s not that skilled labour regardless. So if you look at a broad low skilled group, you could have winners and losers in that group and the overall employment effect might not be that big, but the group that had the lowest wages and the lowest skills to begin with might have gotten hit pretty hard. So that’s one thing we want to keep in mind. When these studies really zoom in on the bottom of the skill distribution, that’s where you get the most compelling evidence and the most important evidence about minimum wage effects. Most important because those are the ones you’re trying to help. "Two other things I want to talk about here. One is - this is all about short term disemployment effects - there is a fear of adverse longer run effects. If you shut out teens from the labour market - and I say teens because there’s low skilled people at every age but teens are just proportionally low skilled because even those of us in the room who now have high-paying jobs, when we were teens we weren’t earning anything and we had crap jobs as people do when they’re teenagers. So, you shut teens out of the labour market, especially teens who aren’t going to go on to graduate school and build their human capital that way, but they’re going to build their human capital through work, you may have adverse long run effects because they fail to build skills that generate earnings growth later on. I run a research institute at UC Irvine that focuses on these long term policy effects and there’s some evidence that these minimum wages have long run adverse effects. Just a short aside. What about that famous New Jersey Pennsylvania food study? This is the study by Card and Kruger at fast food restaurants in New Jersey and the part of Pennsylvania right next to New Jersey that found when the minimum wage went up in New Jersey, employment rose strongly in New Jersey. It didn’t just not fall, it rose by what is probably an astronomical amount. It gets cited a lot. Washer and I reevaluated that study, getting much better data. Card and Kruger then came back also with better data and the evidence says either the employment fell or not much happened at all. But there’s no clear evidence that somehow this study overturns what we should think about labour economics. It’s just not the case. "Then there’s a whole set of recent studies. I thought I was kind of done with this - we wrote our book in 2008 - I kind of said “I’m done doing minimum wage studies “ and I sat it out for at least two years and then a student group of researchers jumped in and started criticizing this approach of using one state to control for another state. It’s a large technical issue that drives this literature, but they argue that the only valid way to estimate the minimum wage effect is to look at a jurisdiction where the minimum wage goes up, and then look at a very nearby jurisdiction. If you can do it, which you can in some US data, a county across across the state border. So you’ve got Illinois which borders Wisconsin, and counties (we have, I think 5 or 6 thousand of them) are areas which often include many cities. The idea is that everything else happening in those counties is so similar but because one is on one side of the state border and the other is on the other, when the minimum wage goes up, you get really clean evidence on the minimum wage. And they assert that’s the only way to estimate minimum wage effects. When they do that, they do not find disemployment effects from minimum wage. So when you see people in the current debate referring to a lack of disemployment effects, this is usually the research they’re talking about. "So, what do we make of it? This is a summary of recent studies that use one variant or another of what I call very close geographic controls. You can only study the minimum wage effect by comparing one place to a very nearby place that we hope is similar but they didn’t have a minimum increase. If we do that, all the studies but the one highlighted in darker yellow fail to find evidence of disemployment effects. So these new studies done this way do not find evidence that employment falls if you raise the minimum. Partly spurred by these guys, this table summarizes a bunch of other studies that deal with the same problem in a different way. And the problem is, that maybe when the state adopts a minimum wage, it’s doing it in response what’s going on in the labour market rather than doing it exogenously. So the minimum wages don’t occur randomly. If you believe the story - and you might scratch you head - that state lawmakers pass the minimum wage when the labour market is going into the tank, then you might think that the state level evidence is going to give you false evidence that the minimum wage reduces employment because it’s not that the minimum wage reduces employment but that it gets adopted when employment is falling. Now, you might say, “why would policymakers do that?” In fact, I think most of us think policy makers will tend to raise the minimum wage when the low skilled labour market is doing very well. Why? Minimum wages are very popular, and politicians know that. Even among Republicans in the US, minimum wages poll favourably. Not much two parties agree on, but that gives different degrees of support. But politicians also know that they get blamed for stuff that happens when they pass these laws even if that law didn’t cause what happened to happen. So passing a minimum wage when the unemployment rate is going up is usually not a very wise idea because someone else might come along and say “that’s because you raised the minimum wage” even though it wasn’t. So you would tend to think policymakers would tend to raise the minimum wage when things are looking pretty good so even if a few people lose their jobs, nobody can tell. So these other studies all deal with this problem in different ways than a geographic one controls. And I won’t go into the details, but almost all of these studies - again there’s two exceptions here - almost all these studies do find disemployment effects from minimum wages and some of them find very strong effects. "I’m going to talk about one just to give you an idea of the different strategies people us. So I said before that the advent in the 1990s was to use states when the minimum wage went up, states where the minimum didn’t go up, and compare the two. The study by Clemens and Wither in this paper says, instead of doing that (because maybe minimum wages are adopted in one state for a reason) let’s look within a state at the very lowest wage workers versus the first group of workers we can find whose wages are low but whose wages are not directly affected by the minimum increase. When you look at those two groups, when the minimum wage goes up, the employment of the least skilled group drops. And you can’t pin that on state lawmakers choosing the policy because both these groups are in the same labour market, just one is more affected than the other. So, what does all this mean? The conclusion is contested - you do not have unanimous answer to the question whether a minimum wage reduces the employment of low skilled workers. Some earlier and some recent papers find no employment effect from the minimum wage and in the future, some papers will continue to find no effect from the minimum wage. Economics is not a laboratory science. There are reasons why some studies may not find that the minimum wage reduces employment. You could be doing a study when the minimum wage isn’t very binding - it just doesn’t matter that much, not many people are affected. You could be, when you do these close-by areas, one question is, is it actually clear that it gives you a better treatment and control group? One of my colleagues said, “well, if two places on two sides of the border are so similar, why is the minimum wage high in one and not the other?” Maybe it’s actually within those close pairs that politicians are most sensitive to how the labour market is doing. Here’s what I think is a take-away from this, because there’s a lot of studies, very hard to follow them all, even if you spend a lot of your time doing it. The vast majority of studies find disemployment effects in the US. There are clearly some that don’t. That’s one thing. The second thing is, if people say the evidence is contested and economists don’t all agree, that’s absolutely a fair statement. But you will see people say, “there’s no evidence that minimum pay reduces employment in the US.” Paul Krugman’s New York Times op-ed in 2015, this is a quote, “there’s just no evidence that raising the minimum wage costs jobs.” That’s flatout false. If he’d said,m “I don’t believe those studies because of x, y, z and I believe these studies because of some other reason,” fine, let’s have the debate. But you do see this mischaracterisation of the evidence get repeated again and again and again and I’m actually not sure why but I think it’s important to keep in mind. I imagine, following the debate here, people talk about the US evidence (because there’s a lot of it) just be aware that when people say there’s no evidence, well, what about this study and this study and this study. Let’s talk about the evidence honestly. "Okay, my one slide on the UK. So as I said, it’s harder to figure out what’s happening here because the minimum wage is national. What people use instead is things like low skilled versus high skilled workers, like the Clemens and Withers study I mentioned, or they look at lower wage and higher wage regions. The same nominal minimum wage should matter less in London than in the hinterlands because the wage levels are lower and will affect more workers. So the studies do things like that, a couple studies by Stuart comparing low and high wage workers and low and high wage regions finds no evidence of job loss. Another paper with Swaffield finds some evidence of hours delines. Lennard et al. have a meta analysis from a few years ago - no overall evidence of job loss but some evidence of job loss in the homecare industry and perhaps retail and food. "So what to make of it? I would say it’s fair that there’s less evidence of disemployment here than in the US, but again, the claim that there’s no evidence is a mischaracterisation. I do think - condition on having a minimum wage - you’ve probably worked out a better system. The minimum wage in the US just gets jacked up by politicians, everyone’s deriled, who knows what? We raised the minimum wage in 07, 08, 09 by 41 percent. The Low Pay Commission, as I understand it, almost shut down minimum wage increases over that period. Cumulative if I have my numbers right, over that three year period they raised the minimum wage by 8.4%. So the ability to respond to the labour market if you’re going to have a minimum wage has to be done wisely, and they seem to be doing it pretty carefully and wisely. Probably moderates the effects and gives you the ability to respond to circumstances and minimise some of the adverse effects. "The minimum wage helps some people for sure, but it hurts others. If I say one take away from my work on minimum wages, it is that like with every other policy you can think about, there’s winners and there’s losers. My research doesn’t say the minimum wage is a bad idea, it doesn’t say you shouldn’t do it, but that there are some costs and you should weigh those costs against the benefits. "So let’s now turn to that briefly. Every government regulation probably costs someone a job someplace. As we enact climate change policy, if you’re an oil refinery worker, it really stinks. At least in the short term, you’re not going to do well. Just like when we reduced logging thirty years ago, loggers lost their jobs. Now, you can’t look at it and say we shouldn’t have climate change policy because oil refinery workers are going to lose their jobs. The job of policy makers is to weigh the benefits and the costs: do we have a problem? Do we need to solve it? Here’s a way to solve it. Recognise that there are some costs, and then make the tough choices. That’s what they get paid to do. With minimum wages, we face exactly the same problems but we have to recognise there are bot benefits and costs. What are the potential benefits of the minimum wage? Well, I would argue the key criterion to evaluate them on is whether they reduce poverty or not. "Here are two quotes. The first is from Ted Kennedy who was in the Senate and one of the chief proponents of a higher minimum wage. He’s quoted in his biography as saying, “the minimum wage was one of the first and is still one of the best anti-poverty programmes we have.” Then there’s a similar quote from Obama. So, I think it’s fair to evaluate whether the benefits outweigh the costs by focussing on the poverty rate. Here’s a slide that suggests it’s a no-brainer. What I do here is show you the percentage of low wage workers in different levels of what we call the “Distribution of Income to Needs.” Income is your income and need is the poverty line. So if your income to needs is one, your income is exactly the poverty line. If your income to needs is two, your income is twice the poverty line, and so on. So this says here, 85 percent of low wage workers are in poor families. And another eight percent are in families below 50 percent of the poverty line. That looks like a minimum wage is really going to target low wage workers effectively. The problem is, that’s from 1939 and if you actually look at the data now, you can see things are way worse. It used to that 85% of low wage workers were in poor families, now it’s around 12%. If you look down here, 40% of low wage workers are in families above median income. These minimum workers are our kids when they worked in high school. The distribution targeted by the minimum wage has really changed radically. It’s changed radically for two main reasons. One is that more people work than used to, for example spouses and children. The second is, you no longer starve to death if you don’t work. All rich countries have a safety net and don’t let people starve to death in the streets. We have all kinds of social programmes partly intended to help people not work if they can’t, partly some unintended side effects - some people don’t work because of these programmes - but it’s possible to not work now. If you look at the data, look at families headed by a person who’s younger than retirement age, more than half of poor families have zero workers. The principle reason why families are poor in the US is because they don’t work or don’t work long hours. Low wages obviously don’t help, but low wages are not the principal driver of poverty. The bottom line is it takes about $5 in payroll increases from the minimum wage to get about a dollar into the hands of the poor family. That’s a terrible trade-off. Most public policyists who think about redistributing income or welfare programme, it always costs more than a dollar to get a dollar to a poor family because we distort the economy to some extent, but it’s often around $1.5 and okay, that’s the cost of distribution. Good public policy, obviously, pushes that number down. But any other programme, if someone said, “I have a programme to help low income people, for every $5 we raise we get $1 to poor families,” you’d say that there’s got to be a better way of doing it. And in fact there is. "One last point before I turn to the alternatives so I’m not all doom and gloom. Some of you can’t see the cartoon so this will be a bit like explaining your own joke. Two workers are celebrating their minimum wage hike and a mother taking her two screaming kids exclaiming, “a Happy Meal is now $15?” The point is minimum wages do lead to higher prices. Nobody really disputes that, but those higher prices are kind of regressive. There’s more lower skilled workers making fried chicken than there are making yachts. So the prices that go up tend to be the things low income people consume more of. And that’s something we have to keep in mind. "Okay. Is it as hopeless as it seems? Well, no. I mean, yes and no. If there’s one thing that is a little hopeless it’s that the economy has changed. Low skilled workers aren’t going to make what they used to make. There are fewer manufacturing jobs, the nature of technology is such that if you invent something now, once it’s refined and polished you don’t need skilled workers to produce it. I think something has happened so low skilled workers are going to make less than they used to and high skilled workers are going to make more than they used to. I don’t see that changing anytime soon and it may even get exacerbated. So what do we do about that? Well, I would say the central challenge is to increase incomes of low income families because all the western countries have an interest in that. We all put floors on our incomes one way or another. But to do that in a way that doesn’t discourage work. The minimum wage does. The minimum wage reduces hiring by firms and in that sense it discourages work. People talk about Universal Basic Income, Negative Income Tax policies. Those obviously put more incomes in the hands of low income families but they do kind of discourage work. They may be okay but we don’t necessarily have to go there. We have in the US something called the Earned Income Tax Credit - it’s kind of like your Working Tax Credit - and what this does it doesn’t give you anything if you don’t work. For people who can’t work we need different solutions. The minimum wage doesn’t work, the earned income tax credit doesn’t work, so we need to take care of the disabled in different ways. But if you can work and you do work, you get a subsidy and in the US this subsidy is up to 45%. If you make $10,000, you get a $4,500 cheque from the government. That’s a lot of money relative to those incomes. The evidence is clear on two things. The EITC encourages work (as does the Working Tax Credit in the UK) and the EITC reduces poverty. It reduces poverty in what is almost a magical way. It reduces poverty just by the work incentive so more people earn their way out of poverty because of the EITC before you even receive the cheque from the government. It targets poor families very well because it’s done through taxes, and that’s my last point. "The point is, there’s winners and losers from a higher minimum wage. The advocates would have us believe there’s just winners - they’re wrong. The critics - the business community often - would have us believe that nobody gains and there’s only huge loss. They’re wrong too, some people are indeed helped. You need research to help figure out who the winners and losers are, what the magnitudes are of those gains and losses, who they fall on (do they fall on poor families or not?) and then we can make the tough decision whether the policy makes sense. I have not yet been convinced by all the research I have seen and done that there’s clear evidence that the benefits outweigh the costs. I don’t necessarily mean to leave you with that argument but my goal here has been to give you some of the evidence on the basis of which you can try to make a better informed decision for yourself."